I wasn’t always great with orchids… In fact, I’ve killed many orchids to the point I was afraid to purchase them. One day I was chatting with a florist about my problem and she offered to give me an orchid out of bloom to practice. She said it’s hard to sell orchids out of bloom and they had limited space so I can take one home. She said the trick is to water them thoroughly then let them completely drain about once a week as long as the soil is completely dry. Better more dry for a couple of days than a little wet. The leaves of your orchid will start to wrinkle and shrivel if they’re too dry but it’ll take months to kill it as orchids store a lot of moisture in their leaves. Whereas too wet and the roots will rot and it’s impossible to bring them back. Most orchids have two pots. The inner plastic pot and the outer, usually ceramic or terra cotta pot. She let the outer pot fill with water with the inner pot inside, let it sit for 5 min, then removed the inner pot to let it drain completely for a few minutes before putting it back in the pot. This makes sense since orchids grow in tropical climates with heavy rain and periods of drought. They also sit clinging to trees so their roots don’t normally stay wet for long. 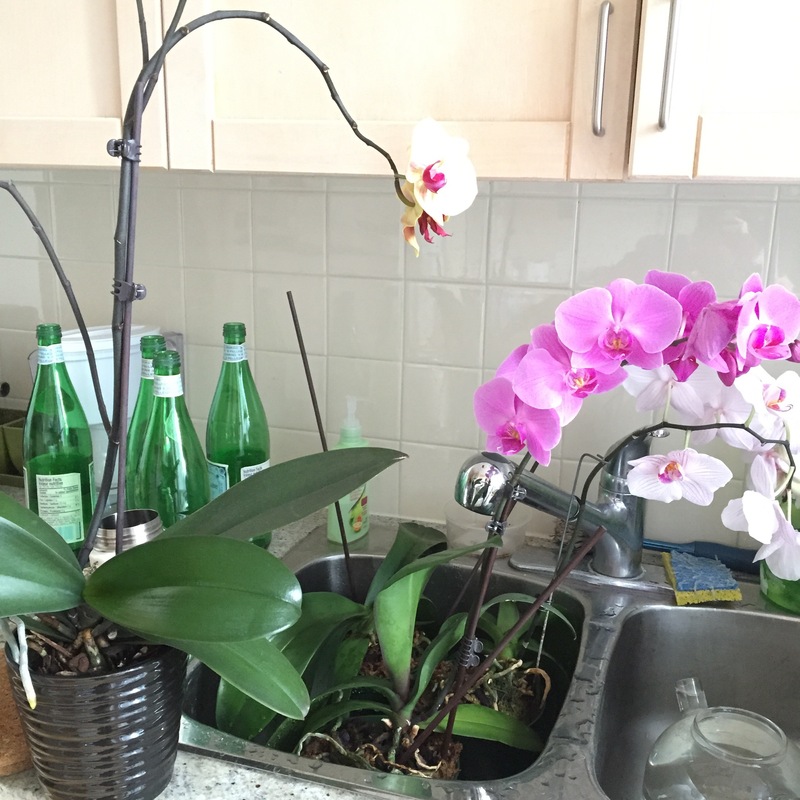 Since adopting this method, I have adopted many friends out of bloom orchids and been able to revive them all for multiple blooms without even the use of fertilizer. It’s also great for washing off the dust that collects on plants. As someone who believes in recycling, it’s been a great treat to bring back orchids even when they’re close to death. And the blooms can go in the compost when they fall off, and when all the blooms have fallen off, cut the stem close to the base of the plant and but the stem in the compost as well but continue to water the orchid the same and a new stem will grow. When the roots start to grow out of the pot consider transplanting into a pot one size up. Thanks for sharing your secrets for keeping orchids alive and blooming. While I’m not going to go out today to buy my first orchid I will be on the lookout for one to adopt. In the meantime, you have prompted me to start thinking about other plants I can start inside now to brighten up the dark winter months ahead. Thanks again!